This page lists the limited number of official recalls that have affected the MGF/TF throughout its life span. If purchasing a second hand car, it is wise to ensure that if the vehicle you are looking at have had the necessary work carried out. In other cases, it pays to be aware of later recalls that may affect the MG you own. Recall #1: Seat belt escutcheon replacement. MG News, October 1998: http://www.mgcars.org.uk/n ews/news438.html; Rover recall number A056. Problem: There is a possibility of that the webbing of the right hand seat belt getting snagged in the slot in the escutcheon in the rear T-bar bulkhead trim. This can lead to snagging of the seat belt and/ or cause belt webbing damage- a potentially dangerous fault. The recall was issued in 1998, and all cars were fitted with a new type of seat belt escutcheon that are pictured below. However, some Japanese-export cars appear to have slipped the net, so if you haven't checked that the work has been performed on your car, it would be extremely wise to do so. Thanks to Kingsley Gale-Sides for the pictures of the original type seat belt escutcheon. Recall #2: VVC Cam bolt torque/ failure. Problem: The cam-bolt on VVC engines had not been nipped up to a sufficiently high torque. As a result the cam bolt could work loose and fail, either exerting excess strain and shearing the locating roll pin or the shearing the cam bolt itself, secondary to vibration and chaffing. This results in the valves striking the pistons causing extensive damage to the cylinder head, pistons and potentially the bottom end of the engine. K-series guru, David Andrews, has witnessed the consequence of cam-bolt failure: "I currently have 11 VVC heads in my garage which have suffered failures of one kind or another. Five of them have suffered loosening of the rear sprocket on the inlet side, this immediately causes the roll pin to take forces it's not designed to handle with resulting failure and mangled valves." 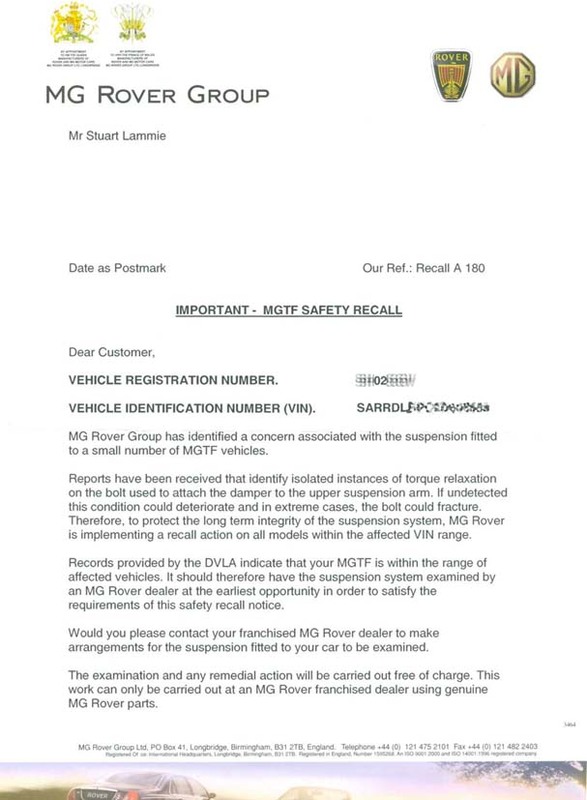 The recall was issued in 1998, and all effected VVCs had their rear cam-bolt torque checked during routine servicing. Therefore, if purchasing a second hand VVC, be sure that all servicing and checks have been properly performed. If there is any doubt as to the torque setting of the rear cam-bolt, contact your local MG specialist. Unfortunately, VVC engines may be at risk of cam-bolt failure in later life, irrespective of whether the engine was subject of the earlier recall or not. This potential failure risk has been recently highlighted on the MGF Technical BBS and arises because of removal the rear inlet cam to ease the replacement of the cam belts at the 5 year/ 60,000 mile service. It is unknown whether or not the original cam bolt should be re-used or discarded (renewal of the bolt is apparently not specified in the MG service schedule). As Mike Satur mentioned on the MGF Technical BBS, "[the cam bolt is a] big bolt for the [MG specified] torque loading but after witnessing the failure of this bolt, we asked the manufacturers (Atlas) to test 20 sets of cam bolts. We found the bolts failed very near to the required [MG specified] torque settings. Therefore on their [Atlas'] advice we have changed the specifications. They [Atlas] certainly would not recommend re-use of the bolts. In fact they did not recommend this type of bolt for this application! However their recommendations doesn't mean that the engine manufacturers would takethe same advice or recommendations as they have different parameters. I asked Rover for the calculated loading on this component but they declined to offer this information. If anyone is in doubt ask Mike Coward for a look at his bill for the repair work on his engine because this bolt was not changed at the cam belt change by his local mechanic. If you feel lucky re-use 'em." Fortunately, the problem with cam-bolt failure does not seem to be quite so much of a problem on the 1.6 and 1.8i engines as it is with the VVC engines. As Spyros Papageorghiou noted, "you don't need to remove the cam bolt or cam gear for the 1.8i but you may need to remove them to change the rear belt on the VVC (the 1.6 and 1.8i have no rear belt)." However, removal of the rear cam bolt is not necessary during cam belt renewal on a VVC. The documented problems above have occurred as a result of independent garages performing the cam belt change. However, specialists such as Mike Satur or MG dealerships, have trained technicians who can perform the work as specified by the manufacturer (not removing the cam) reducing the risk of later cam bolt failure. Recall #3: Chaffing of Seat belt pre-tensoner cable. Problem: The seat belt pre-tensioner cable behind the left hand closing panel of the centre console was found to be chaffing against the body work. The potential risk is that the protective sleeve of the cable would wear and cause the circuit to short, firing the pre-tensioner unintentionally. Solution: if the cable is not damaged, an additional plastic convoluted tube (part# YMQ 002020), is placed over the main loom that runs closest to the metal heater control mounting, for extra protection against cable damage. Recall #4: Potential suspension bolt failure. Problem: "Reports have been received that identify isolated instances of torque relaxation on the bolt used to attach the damper to the upper suspension arm. If undetected this condition could deteriorate and in extreme cases, the bolt could fracture." Solution: The torque of all four lower damper bolts needs to be checked. If found to be loose, the bolts need replacing.